This is a reminder that we are CLOSED on Monday, April 15 in honor of the Boston Marathon. If you or a family member are running, have fun! Go go go! We will be open as usual on Tuesday. As always, you are welcome to make up any classes missed. There WILL be Vida Yoga this morning from 7:00-10:00 am. However, because of the snow today, JPMAA will be CLOSED after Vida Yoga, with all classes cancelled for the rest of the day (Kids karate, BJJ, Adult karate). In honor of the Martin Luther King, Jr. Holiday on Monday, January 21, JPMAA will be CLOSED for all afternoon and evening classes including Kids Karate, BJJ and Adult & Teen Karate. Please note that the dojo will be OPEN for VIDA YOGA with Andy on Monday, January 21 from 7-10 A.M. Addition: Vida Yoga with Andy on weekday mornings. Minor Modification: MMA on Monday evenings is now 45 minutes, from 8-8:45. Come try it out! It is an honor and a privilege to announce a new yoga program presented by JPMAA and Vida Yoga Boston. Together we have created a program that is accessible to all. Based in Ashtanga and taught in English and in Spanish, we strive to unite the communities here in the heart of Boston. Classes start January 7th so come and join up. See details below if you would like to join us! Es un honor y un privilegio anunciar un nuevo programa de yoga presentado por JPMAA y Vida Yoga Boston. Juntos hemos creado un programa que es accesible para todos. Basado en ashtanga y enseñado en inglés y en español, estamos tratando de unir a las comunidades aquí en el corazón de Boston. Clases empiezan Enero 7. Ven a practicar con nosotros. Los detalles estan abajo! 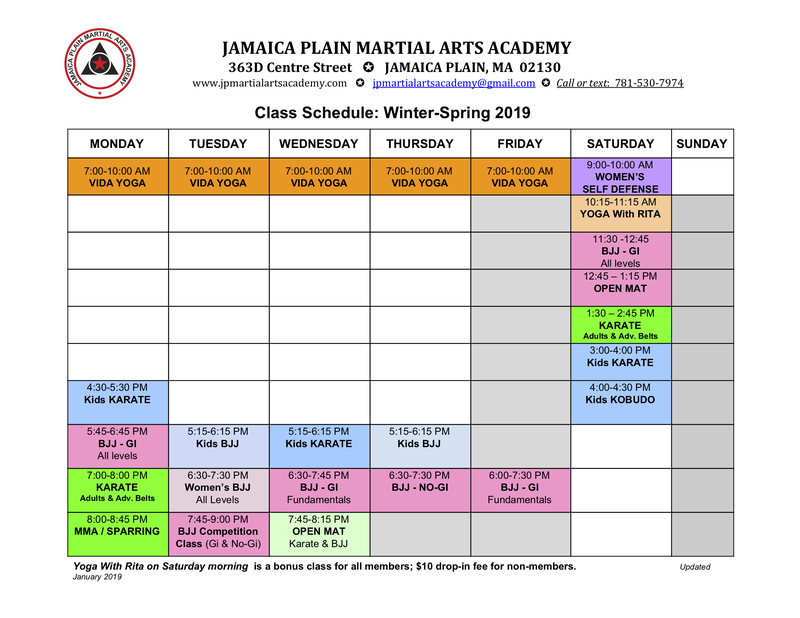 JP Martial Arts Academy is open for all regular classes through Saturday, December 22. However, we will be CLOSED during the holiday week, beginning Monday December 24 2018 through Tuesday, January 1, 2019. We will be open again for all classes on Wednesday January 2, 2019. Veteran’s Day: Saturday November 10 through Monday November 12 is a long weekend in honor of Veteran’s Day. JPMAA will be OPEN for all classes on Saturday November 10. JPMAA will be CLOSED for all classes on Monday November 12. Thanksgiving: We will be CLOSED for Thanksgiving from Wednesday, November 21 through Sunday November 25. Hope you all have a great November and we’ll see you on the mats!